A robotic Russian cargo spaceship experienced a glitch shortly after launching toward the International Space Station Tuesday (April 28), delaying and potentially imperiling its arrival at the orbiting lab. Russia's unmanned Progress 59 spacecraft blasted off atop a Soyuz rocket at 3:09 a.m. EDT (0709 GMT; 1:09 p.m. local time) Tuesday from Baikonur Cosmodrome in the Central Asian nation of Kazakhstan. Everything went smoothly until the cargo vessel separated from the rocket. Progress 59's solar arrays deployed on schedule, but some of its navigational antennas apparently did not deploy, NASA launch commentators said. Russian flight controllers have also been having trouble uplinking commands to the Progress 59, and there may be issues with the vehicle's propulsion system as well, commentators added. Progress 59, which is loaded with about 6,000 lbs. (2,720 kilograms) of food, fuel and other supplies, was supposed to arrive at the orbiting lab just six hours after liftoff, at about 9 a.m. EDT (1300 GMT) Tuesday. But the antenna issue will push the docking attempt back by nearly 48 hours, to 5:03 a.m. EDT (0900 GMT) on Thursday (April 30). 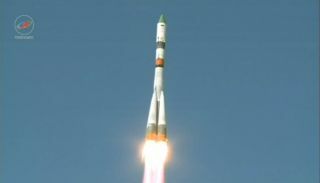 This switch from the fast track, four-orbit route to the International Space Station to a two-day journey that requires 34 orbits to complete is "part of the nominal backup plan for all Soyuz and Progress vehicles" and gives Russian flight controllers time to try to troubleshoot the problems, NASA commentators said. Image showing the Kurs antenna system on Russia's robotic Progress spacecraft. It was not entirely clear shortly after liftoff just what those problems are, or if they are fixable. Initial telemetry readings suggested that the Progress 59's two Kurs "automated rendezvous antennas" failed to deploy, but later telemetry seemed to indicate that the Kurs antennas are behaving normally but other antennas did not deploy, NASA launch commentators said. The Progress is one of four different robotic vessels that ferry cargo to the space station. The other three are Japan's H-II Transfer Vehicle and the Dragon and Cygnus spacecraft, which are built by American aerospace firms SpaceX and Orbital ATK, respectively. Dragon is the only one of these craft that can bring cargo back down to Earth (the others are designed to burn up in the planet's atmosphere). Editor's Note: This story was updated at 5:30 a.m. EDT.